The VW T-Roc posts a second consecutive Top 5 finish in Austria. New car sales in Austria edge up 0.4% to 32.551 registrations in May, leading to a YTD volume up 2.5% to 154.846 units. Brand leader Volkswagen (+4%) outpaces the market to hit 18.2% share vs. 17.6% so far in 2018, followed as usual by Skoda (-8%) in difficulty. Below, Ford (+12%), Seat (+20%) and Hyundai (+18%) all post spectacular gains, knocking Renault (+1%), BMW (-7%) and Opel (-19%) towards the tail end of the Top 10. Ssangyong (+144%), Jeep (+137%), Lada (+93%), Subaru (+66%), Mitsubishi (+60%), DS (+47%), Smart (+34%) and Kia (+10%) also shine further down the ranking. Model-wise, Volkswagen monopolises the Top 5 for the second month in a row and the third time ever after monopolising the Top 6 back in December 2012. Note Volkswagen has managed the same feat in Germany this month. 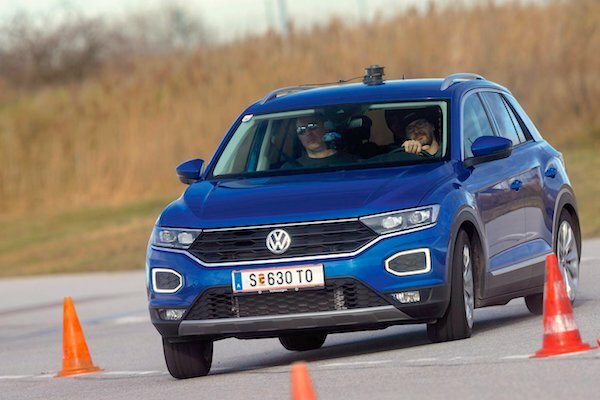 The Golf (-22%) keeps the lead despite a steep decline, ahead of the Bus aka Transporter (+26%) again catching up on a diesel sales ban at the start of the year like in Germany and Switzerland, the Polo (-10%), Tiguan (-2%) and T-Roc snapping its second Top 5 ranking in Austria just as it breaks into its second Top 5 in the world in Switzerland. The Hyundai Tucson (+119%) shoots up 12 spots on April to #6, the Ford Fiesta soars 71% and 21 ranks to #9 and the Dacia Duster surges 72% and 7 spots to #10, while the Seat Arona gains 5 ranks to #11, its highest ranking so far in Austria. Among recent launches, the Skoda Karoq is at #20 (-7), the Opel Crossland X at #27 (-3), Jeep Compass at #28 (+20), Opel Grandland X at #52 (+3) and Kia Stonic at #80 (-26). Full May 2018 Top 50 All-brands and Top 305 All-models below.